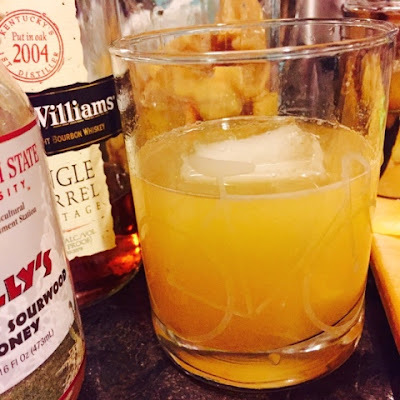 Recently there was a post floating around the internet, from SmittenKitchen's blog, showcasing a drink called a Vermontucky Lemonade. It was a mixture of lemonade made with maple syrup, ice and a generous shot of bourbon. Tempting and tasty. I knew I had all the ingredients to make my own, with a few tweaks here and there. My version of Smittenkitchen's vermontucky lemonade uses fresh lemon juice, water, Mississippi Honey, and for good measure, the preserved lemons and ginger that were put up in honey and bourbon, They added a piquant spicy note. I used the preserved lemons and ginger because I had them. They were good in this version of the drink but I think for a warmer weather cocktail, I'd stick to the straight-up lemonade version. Don't forget to toss in a generous shot bourbon. I pulled out of my collection an Evan Williams Single Barrel 10 year Vintage Bourbon. This bourbon was a good match for the tartness of the drink. This is a cocktail perfect for warm humid days. Good for an after work pick-me-up. I suspect this will be a good go-to cocktail for hot spring and summer days ahead. Peel the lemons, being careful to not get any of the white pith on the lemon peel; set peels aside. (extra lemon peel can be dried and ground to use in other cooking and spice blends) Roll the lemons to break up the membranes before juicing. Use a juicer or reamer to extract the most lemon juice. Strain out the seeds and pour lemon juice into a cocktail shaker. Pour in the water and add in the honey. Stir the lemonade until the honey dissolves. Taste and adjust with more honey and/or water as needed. The lemonade should be tart and slightly sweet. Add in the cracked ice and bourbon. Cover the mixer and shake rigorously several times. Strain and pour the drink over a large ice cube in a rocks glasses. Garnish with either a lemon peel or wedge. Makes 2 drinks.